A Play, A Pie & A Pint Autumn 2018 Season Announced! 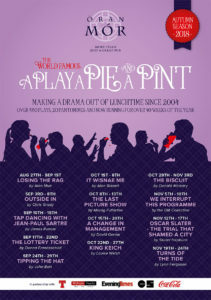 Welcome to our Autumn 2018 season of A Play, A Pie and Pint at Òran Mór! Meet ‘The Heatherbelles’ as they hit dry land after 40 years on cruise ships, tip your hats to Flanders & Swann and tap your toes along with Fred Astaire and Audrey Hepburn. Uncover the gross miscarriage of justice of Oscar Slater, witness a young soldier’s return from the Somme and see how a lottery ticket changes an emigrés life. What happens when an agoraphobic has a gun shoved through his letter box? Or when a WagonWheel is the only food left in a safe house? And join us to revisit a classic tale of an obnoxious patriarch who becomes intoxicated with power – in this day and age, who’d have thought it?